A Craigslist poster is looking to trade a life-size Joel Embiid balloon animal for tools and lumber. 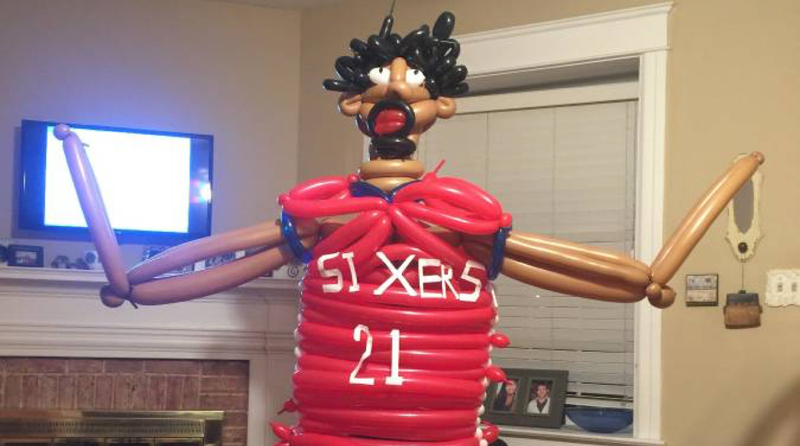 And the strangest Craigslist ad of the day goes to this Philadelphia 76ers fan, who is looking to trade a life-size Joel Embiid balloon animal for tools and lumber. The poster thinks that this is a good alternative to getting a customized balloon animal from a company. Where else in the world are you going to find a Joel Embiid balloon animal? "I don't know how or why but I am some sort of balloon prodigy, I can make literally anything out of balloons. Ridiculous giant balloon sculptures are great for parties, as a gift or just to leave on someone's porch as a weird and confusing joke. I left a 5 foot T. rex in the first unlocked car I could find and I still laugh about it every day. I can deliver most sculptures by car but large structures like a castle or working balloon pub would need to be finished on site. Lifesized balloon sculptures take all day to make and can run into the thousands of dollars from party companies most of whom don't offer anything so customizable to begin with. I am looking to trade for tools. I got bored with balloons and am moving on to make things out of wood. I am especially interested in: Jointer/planer, Miter saw, A better miter gauge for my table saw, Impact driver, Router bits or accessories and Oscillating multi-tool." Hopefully, this doesn't inflate Embiid's ego.